On Wednesday, September 12, the School of Art opened Ruptures: Forms of Public Address, the third exhibition organized by Dean Saskia Bos and Associate Dean Steven Lam at the 41 Cooper Square Gallery. Free and open to the public through October 13, the exhibition features an international group of artists exploring politically vital issues surrounding the struggle for democracy and public space. Writing in the New York Times, critic Holland Cotter suggests that Ruptures positions art in relation to politics as a thing "to interrupt the flow: not to be right, not to be wrong, but to open a space for hard, resistant thought." Below, Saskia Bos and Steven Lam discuss their curatorial strategy and approach, and the wider issues at stake. Bosko Blagojevic: Why Ruptures? Why now? Saskia Bos: You could do a show about ‘ruptures’ at any moment in time because, depending on your focus, you could determine ruptures to be the sort found in art—and the history of all art is about such ruptures, about new movements and breaks, sometimes evolutionary and sometimes revolutionary. There is a long history of that in art, obviously in the twentieth century—there is Mayakovsky, there are the Futurists, the Constructivists, and the whole social political embrace of the streets and protest that is larger than art and in which art has a wider role. I think that inspires many artists today. And why now? Because a lot has happened recently—in the streets, and not necessarily in America first. We think of the Arab Spring, and the way it has entered certain political discourses. We’ve seen this kind of thinking localized in various places around the world—an earlier title of our show was "From Tahrir to Wisconsin"! It was that moment that we wanted to take as a point of departure, and it was originally scheduled for last year. Steven Lam: I think the stakes are higher this year. Last year we were caught up in the fever of the utopian impulse, of the growing Occupy movement, of public assemblies. The great thing about the Arab Spring was that it broke down any kind of racist thinking in the West that the Arab world could never aspire for democratic ideals. It’s not just the emancipation of these democratic gestures that inspires us but also the danger of their foreclosures. The subtitle of our show is Forms of Public Address, and by that we wanted to engage art’s capacity and role in such historically evolutionary or revolutionary moments. BB: What constitutes a public address? Is it an address to power, to a populace, to an individual? Who makes such an address? SB: All three: either combined or individually. And through art you can do this in different ways. The artists are not always literally addressing a public—although we are in a public space that is free to enter—but it’s not always directly about public speech. It’s often subverted, or changed, or quoted—it’s often layered and more complex than just framing one kind of speech. The functions of public address are what we are also exhibiting here—giving voice or creating ambiguity, analyzing or deconstructing, reintroducing the past or interrogating it. Other times it’s about the artist giving voice to others, rather than expressing themselves—for example in Krzysztof Wodiczko’s War Veteran Vehicle project, which literally gives voice to veterans of the Iraq war. SL: In an election year, public address often comes to be associated with a specific type of media visibility. But what we’re trying to present here are alternative forms of speaking and making that art has a potency to create. BB: It seems like there’s a catalog of strategies here on display. What made you want to put these works in proximity to one another? SB: We didn’t want to do an exhibition of visualized speech acts; we didn’t want to do a theme show. Our issues are larger. In general I prefer to talk about the contour versus the concept of a show—it is one of the cornerstones of my thinking. You have certain thematic points that you’d like to cover in a show, so you try to find the contour of those points on a plane—such that a new territory is demarcated, almost in a geographic sense. In that terrain, new things emerge. This is an approach that helps me avoid creating a show around an already formed idea—in contrast to the fluid potentiality of artistic and curatorial thinking through and around subjects. BB: Both of you have extensive experience working in museum, biennial, and gallery contexts to produce curatorial projects. Is making a show like this at an academic institution different? SB: There are a lot of questions under the question, and there are a lot of answers. We certainly try to create exhibitions with the faculty in mind, and the community they foster with their students through the issues that emerge through their teaching. We always try to create exhibitions that are relevant to the curriculum here, in that sense. SL: We are also in conversation with the history of the context in this case. Cooper Union has always been a place that has defended and championed public address and free speech. SB: Curating in an academic context is much more specific than simply selecting a topic and inviting the public in. We serve multiple publics here, with varying levels of engagement with the institution: there are the students and faculty, but there is also the wider outside community that is likewise invited to the show. There is the staff, and our colleagues and peers from the world of art and from other fields. We have to take them into account. It’s never one public, it’s never the public. BB: In the press release, you describe “the urgency, promise, and fragility” of public speech. I was struck by “fragility”—what does that word mean in a world where many of us have access to the Internet and other telecommunications technologies that allow us to project our voices so far and wide across the globe? SL: Speech, access to speech is a fundamental right, and one can argue, is also a privilege. Cornell West says that freedom cannot strictly be defined in ontological terms—you have to fight for it, to activate and preserve it. 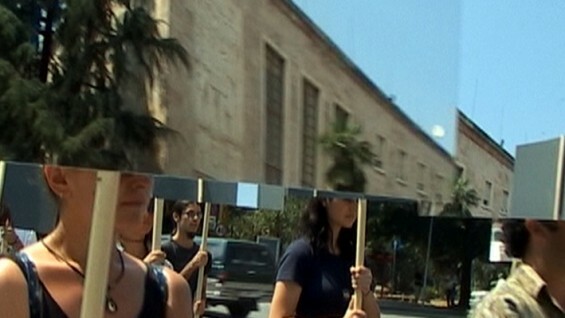 Lincoln Tobier’s work in the show, for example, documents the last protest in Algeria, which happened in 2001. Since that time, the state there has banned all forms of public assembly for protest, and a blanket has been cast over the populace that severely limits the visibility of that sort of dissent. Speech remains very much a fragile thing, despite technical advances. There is also a darker side to public and free speech that we explore in the exhibition and that can’t be ignored. In Igor Grubic’s work for example, the artist recreates a dramatic reenactment of violent disruptions of gay pride parades that have transpired in Zagreb, Croatia and Belgrade, Serbia over the last decade. In this instance the artist highlights a very public disruption of speech by neo-nazi skinheads who claim to speak for a different sort of public. BB: Would it be unfair to say that this exhibition is about looking at the ruptures of the past? Or is it trying to say something about this moment, about right now? SB: I think it’s mostly about this moment. And for those works that are referring to specific moments in history, or are older works that we have selected—they all point to today. What did we know about Occupy this time last year? Not much. Yet today we talk about it historically. Do we know what’s going to happen this September? It’s hard to make a statement for any future, but I think it’s of primordial importance for any artist or curator to make a statement about today as much as they can.